I like a rock opera. There, I said it. If I’m in the right mood there is nothing more uplifting than a hugely bombastic, sub-classical, up its own arse (in a good way), melodramatic musical. I find enjoyment in some of Andrew Lloyd-Webber’s most over the top moments; I’d really love to see the revival of Chess (other than the fact it stars Alexandria Burke – but that’s another story.) And this love of musical theatre passes into some of the rock music I enjoy. From seeing Queen and Marillion strut their stuff in the 1980’s right up to recent live extravagant shows by the likes of Muse, bands who rock up to stadiums with music and shows that fill these open spaces will always flick my switch. Sometimes bands will try to create albums that have the feel of something theatrical. Sometimes they get the balance right and don’t fall into the trap of just creating something a bit naff. And sometimes they don’t. Starting up the first track off the new album, ‘Never Too Late’, by Dutch prog rockers Tumbletown, I had a fear that I was going to be investing time in something on the wrong side of pretentious; it’s a pet hate of mine – opening album tracks called Prelude (or Intro or something equally unadventurous. Give it a proper name guys!) But my fears were soon allayed as we entered the following songs which, on the whole, are marvellously evocative, clever and brilliant tracks. Ok, lyrically there are some clunky moments; but this I can forgive most bands writing words in a second language. Mind you, it is no worse than some of the worst lyrical excesses of ‘try too hard’ poetry that finds its way into a lot of English prog rock bands too (you all know who I mean here – no need to say much more.) It doesn’t get in the way of the overall enjoyment; cut some slack for lines like ‘looking into my notebook’ and ‘lost muses’ and no harm is done and, to be fair, the stories and tales do flow, the third track, Avalon, being a particular highlight for me. On first listen to the album I found myself a bit disconcerted as I heard a famous voice in the mix; not literally, but there was a spirit of somebody which I couldn’t put my finger on. What the album did do on subsequent listens was that it opened up doors and avenues to explore, each time you can pick up a new intricacy here, a nuance there. It was one of these nuances that finally allowed the mystery to click as I got the touchstone I was looking for that, being for me, huge similarity to the great Ian Anderson (25 years or so ago, not now he’s lost his range.) That realisation is what made the album for me, this is a kind of Jethro Tull album for the 21st century and that really does fit. 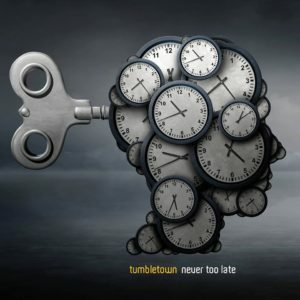 After all, Tull and Anderson were always at the forefront of progressive music as a theatrical experience; something Tumbletown’s ‘Never Too Late’ has taken, developed and updated for today’s music.